Hopscotch is an integral part of childhood, drawing not only on elements of athleticism and fun but also upon mental acumen because it ignites and inspires a child’s desire to create, to design new rules, and to bend old ones. For younger children, it aids in the process of learning to count. It requires almost no supplies to play, yet it can be as complex as its players would like. Hopscotch is a simple game that’s hundreds of years old, and it continues to captivate players just as well in the 21st century as it did in 17th century England when it became a widespread phenomenon. There is no way to know for certain when and where hopscotch was first created, although the earliest record of the game may have come from ancient Rome, where children would skip over stones thrown into the ankle-deep sand. Hopscotch is a game played all over the world; in Spain, it’s called Rayuela, in Poland, it’s called Klasy, and the Italians call it Mondo. Hopscotch, as you may infer from the name, is a delightful hopping game which can be played in an open indoor space, on a stretch of asphalt, like a parking lot or driveway, or even upon a bare patch of ground. The first thing you need to know about how to play hopscotch is how to draw the court. To draw out a court, players usually use chalk to draw on asphalt, but to make the game accessible on a rainy day, you can use masking tape to make an indoor court that’s just as much fun to play on. The pattern for the court is made of a linear series of squares, which are usually drawn about one-square-foot in size. The linear path of the court pattern is interspersed with blocks containing two lateral squares. Each one is inscribed with a numerical value, and each one takes on an incrementally increasing value. The blocks labeled ‘4’ and ‘5’ are usually drawn beside one another, as are the ‘7’ and ‘8’ blocks. The linear series of squares usually ends at a large ‘10’ square at the end that many players call ‘Home’ or ‘Heaven’ to distinguish it from the other blocks. However, there is really no need to rely upon tradition; there can be as many numbered blocks in a court as one dares to make, given the space allowed, and you can change the size and the shape of the playing court to make it as challenging as you want. The last thing you need to play hopscotch is a marker of some kind, such as a hockey puck or a small stone, as you will toss this “totem” onto the court to mark which square you must hop over as you “hopscotch” your way through the course. The beauty of hopscotch is its simplicity as you can easily play it indoors or outside with your friends and family. Anything you can use to draw or designate a court made of squares on the ground is acceptable. Besides using chalk on asphalt, this can include masking tape on a carpet or hardwood floor or pieces of paper laid out in patterns, or you could even use a rock can to scratch numbered squares into the soil. The other thing necessary for learning how to play hopscotch is a totem, the small object each player throws at the beginning of their turn, which can be almost anything. Small sandbags are popular choices for children because they don’t bounce, roll, or skip as easily as small objects like bottle caps, but you lose the randomness of the game that comes with totems that bounce, roll, or skip around the court, because it can add a challenging element of surprise to the game. To learn how to play hopscotch, a player must cast the first stone by throwing his or her marker (totem) onto the court in an attempt of having it land within the confines of the first square, and this one then becomes temporarily off limits to the player’s hopping through the course. The marker must not touch the boundary of the square or bounce from it, and if this happens, the player must give up his or her turn and make way for the next player. After a player gets his or her totem in the first square, he or she must hop over the first square and leave the puck where it was last dropped. Now here is the hard part: A player, after throwing his or her totem, must try to make his or her way from the first square (assuming that square hasn’t been disqualified by another thrown totem) to the last, hopping on one foot from square to square, until they have reached the end. With each new turn, the player must try to toss the totem into the next numbered block, and once again avoid stepping in the block in which the totem landed. A player loses his or her turn if he or she doesn’t hop over the disqualified square occupied by his or her totem, he or she jumps outside the box, skips a number, or switches feet without the use of a double box. The player must hop with care until reaching block 9, but players may hop in block 10 in any manner because it’s considered neutral. The first person to complete the sequence for every numbered square on the court wins the game! 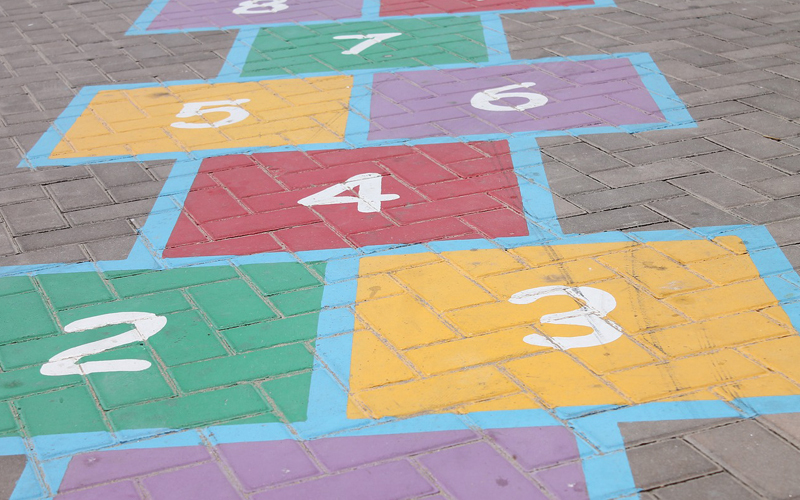 There are a few other considerations you should keep in mind as you play hopscotch. Depending on how the court is made, if players choose a route in which two squares are placed side by side, players must use both feet, the left one in the left square and the right one in the right square. Players may, however, change which foot they use in the next series of single squares. There is a little leeway regarding which feet a player can use in each square, but in most cases, the rules imply that the single blocks may only be occupied by one foot at a time. Once players have earned the status of being hopscotch pros or they have just grown restless with the more simplistic versions of hopscotch, they can add variations to create a more intricate and difficult hopscotch course to play. 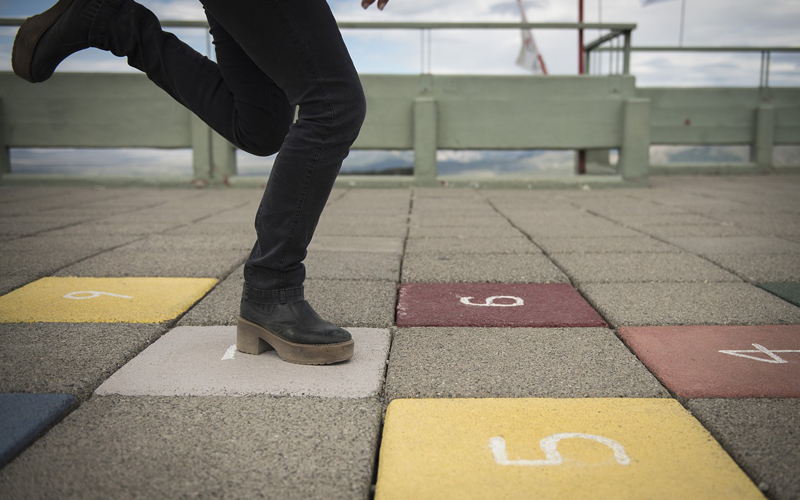 Speed hopscotch is an option for those who need a more thrilling match to their playing abilities. It may be easy to beat friendly counterparts, but how easy can it be to beat the clock? Decrease the time allotted to complete a game to challenge yourself and other players. One can also designate certain squares as ‘islands’ that must be hopped over every time, and the size of these ‘islands’ can be changed to match the skill level of those playing in a particular match. This variation helps players learn how to play hopscotch with a new sense of agility. Want to know how to play hopscotch in France? The French have an interesting way of playing the game that changes the shape of the classic linear course. Starting the series of numbers from a single point that spirals outward, the French version of hopscotch makes for an attractive, though very different, layout. The French refer to this rare, delightful hopscotch shape as ‘escargot,’ and it’s a lot of fun! 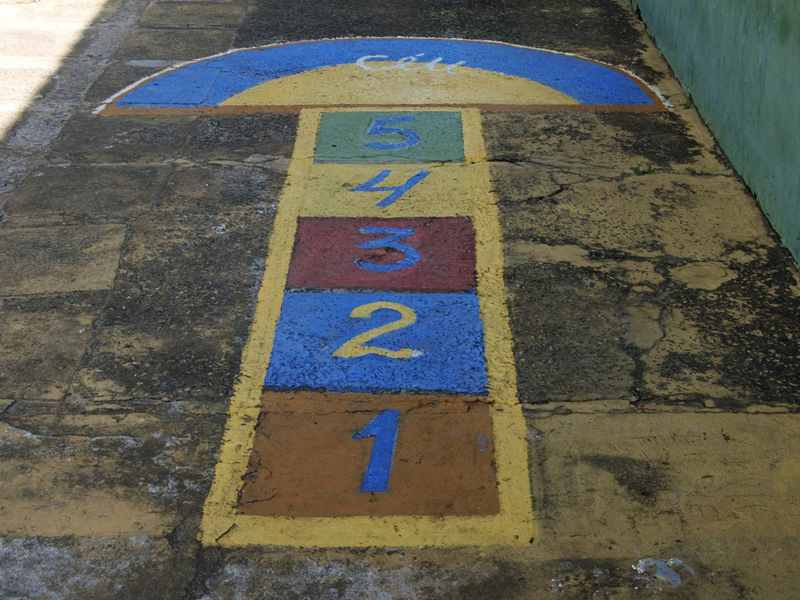 A Neo-classical variation of the hopscotch involves not only a player succeeding by jumping to the highest number, but he or she must then complete the course backward, including the skipping over the totem, until they reach the first square. Unlike the classical version of hopscotch, the neo-classical requires each successive round to add a new totem to the arena, making it increasingly difficult to navigate and complete the course. There are even handicapped accessible versions of this age-old game, like wheelchair hopscotch. As in the traditional version, a totem is thrown into a square to mark which square must be skipped, and a wheelchair-bound player does so balancing on two wheels in a pop-a-wheely fashion! Easy to play and virtually free to create, hopscotch is an entertaining game that can be enjoyed just about anywhere by players of almost any age and ability level. Hopscotch can be made into a thrilling game for creative minds that are only limited only by one’s imagination. 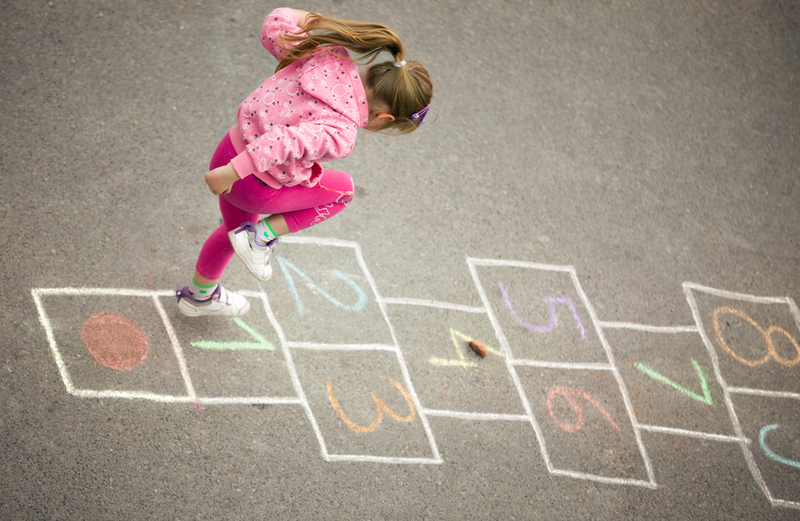 We hope this article has helped you better understand how to play hopscotch, and we wish you happy hopping!